How I Gained It: Three years ago, I was in the throes of depression, PTSD and anxiety. I was also on a ton of medication and had to use a CPAP machine in order to sleep. I have battled all my life with weight. Whether it was not eating and over exercising, binging and purging or just plain over-eating, I had always battled. I ate everything. I ate steaks, lots of potatoes and very few vegetables or fruit. I ate sugary desserts almost every night. I ate McDonald's on a regular basis and drank soda multiple times a day. Two years ago, I became tired of it. I became tired of grocery shopping in a motorized cart. I became tired of not being able to tie my own shoes. I became tired of not being able to walk short distances without becoming winded. I grew tired of being tired all the time. I became tired of being sick and tired. I was abused as a child. I used my overweight body as a shield. I think deep down inside, I thought being fat would keep me safe. I didn't allow myself to feel, or if I did, it was anger and sadness. My days consisted of getting up, taking my daughter to school and laying back down until she got home. Then my partner would be home, and I would sit and watch TV until bedtime. I had no desire for relationships with other people, and I had no confidence in myself for anything. I had lost jobs because I could not handle stress and anxiety from my PTSD. Breaking Point: My father is overweight, and he has tried to lose weight several different times, all resulting in losses and gains but his health problems always remained. We have a now 8-year-old daughter. I want to be healthy and active with her, and I want her to be proud of me. I want to do things with her. I wanted to be a better person. I just wanted -- and still want -- to make a positive impact in my daughter's world, my partner's world, and to my family, friends and the big world. How I Lost It: My partner signed us up for a gym, and that was the beginning of a new start. We started with simple changes to our diet, like going from regular Pepsi to Diet Pepsi, and changing our beef to lean beef. We had always used whole-grain pasta, so there wasn't much change with that. Now, I am a vegetarian. My diet consists of a lot of leafy green vegetables, protein shakes, fruits and whole grains. I feel so good eating the way I do now. At the gym, I started with a Zumba class. I instantly loved Zumba. However, I recall crying the first month because it was all I could stand to just step side to side and keep up. After a few months, I began making excuses, and I quit going. Then, since no one checked to see why I wasn't still coming, I used that as an excuse and gained back what weight I had lost. A few months later, I started over again. I cried through some Zumba classes again, and then four months later, I began adding other classes. 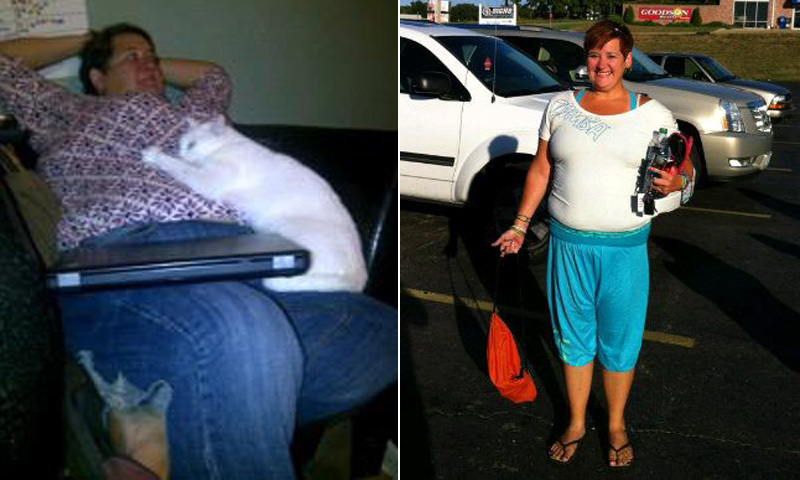 Before I knew it, the weight was just melting off of me and in 10 months, I had lost 100 pounds. Then, I became a licensed Zumba instructor, and the following January, I picked up my own class at the gym. Now, I am 135 pounds lighter and teach at the gym seven hours a week, plus do my own workouts. I wish I could convey the magnitude of the change in my life. My outlook on life is so different. I like to say I went from Negative Nancy to Positive Patty. I get to encourage and support others on their journey and be a positive impact, rather than hide away and protect myself with fat. I only take one pill for depression now, and it is a very small dose. I used to take several. I no longer have to sleep with a CPAP machine. I am nowhere near perfect or finished with my weight-loss journey. I would still like to lose around 60 to 70 pounds. However, in the past, I never thought my life could be like this. I never thought I could do something so great on my own. I was always looking for the easy way out, but I did this and I did it on my own! I am so very grateful for the life I have now and the strength -- physically, emotionally, mentally and spiritually -- that I have gained. Current Weight: 214 pounds. I do still plan to lose another 60 to 70 pounds.